Snacking better starts with shopping better. It’s important to make good choices in the grocery store and keep the high in sugar, fat and salt junk food from ever crossing your doorstep. In the store, read labels and be sure to look at everything. There are many items that are low in calories but high in sugar and salt. And be sure to stock up on items that don’t have labels like fruits and vegetables! Make a “cheat” day. Just like a diet, children do need to be able to indulge once in a while. Allowing for one indulging snack during the week teaches children that it’s alright to enjoy these items but it has to be done in moderation. Talk about your resolution with your tweens. Explaining to children that there are going to be changes and why allows them to process and understand what is going on. Discussing with everyone what it means to be healthy, why it’s important and the changes you’ll be implementing is important for getting them on board. It’s also key to changing their behaviors. Seeking out healthier alternatives is also an easy way to make the transition easier and improve the entire families health. For example, replace potato chips with pop chips. Popchips are neither fried nor baked but pack tons of flavor. We recently tried Original, Katy Perry Kettle Corn and Barbecue flavor in our homes and at our Between Amigas event. The tweens really enjoyed them so much so that we used them as a “healthier” snack for Girl Scout meetings. In the work bowl of a food processor, place the almonds, popchips, olive oil, lemon zest, juice, rosemary, garlic and salt. Process until coarsely chopped, the mixture will be a thick paste. Arrange the chicken breast halves on a baking dish. Divide the almond paste and spread on the breasts; pat down to cover each breast completely. Roast in the oven until cooked through and an instant-read thermometer reads 165 degrees F to 170 degrees F, about 10 minutes. Loosely tent with foil and let stand 5 to 10 minutes before serving. 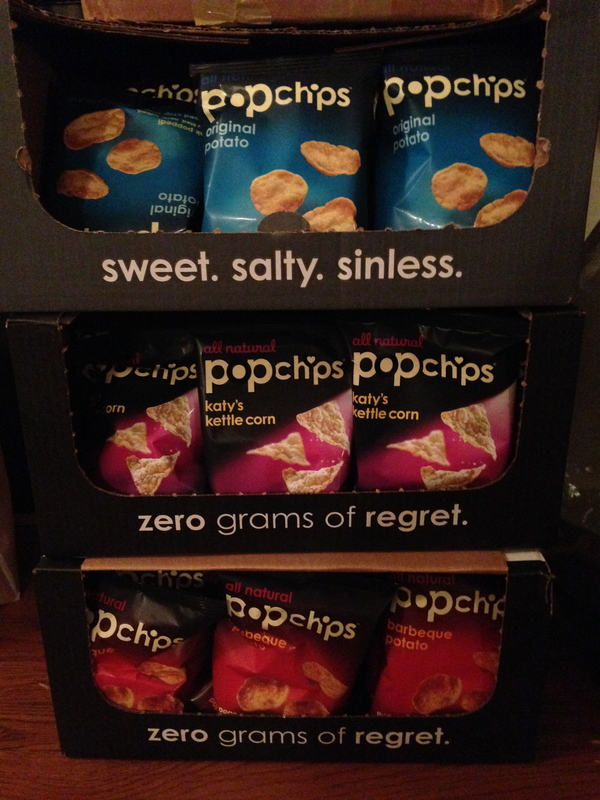 Win your own case of popchips by sharing your new year resolution in the comments below. Be sure to input your information into Rafflecopter. Giveaway ends 12 am on 1/31/14. This entry was posted in Fitness and Health, Recipes and tagged eating healthy, healthy, home, new year resolution, recipe. Bookmark the permalink. My New Years Resolution is to live a healthier lifestyle, by eating better and exercising more. I hope to be a better healthy example to my children so they develop good and healthy eating and exercising habits! My new years resolution is to exercise regularly, drink more water, and make healthier eating choices! So far it’s going great! My New’s Years Resolution Is To Eat Healthier And Maintain An Exercise Routine.